Have you received notice that your personal data has potentially been accessed without authorization? Even if you haven’t, you’re sure to find these 5 ways to protect your personal data useful. It seems like just about every month we hear about a new data breach. But what does that really mean? A data breach, also called a security breach, is when confidential information such as your credit card number, health info, social security number or other information is exposed or accessed by someone without your permission or knowledge. One of the most recent in the news has been the Anthem Blue Cross security breach. 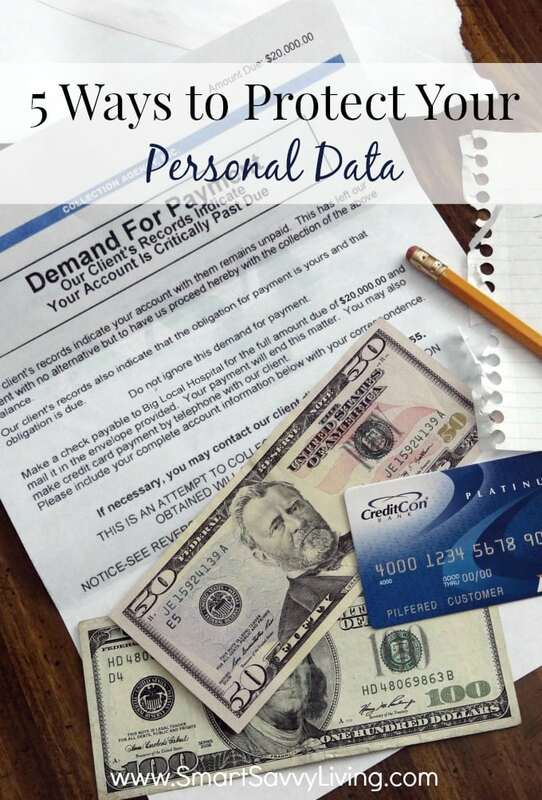 Did you know that studies show that those who receive notice of a data breach are more than 4 times as likely to become a victim of identity theft? Ouch, especially since Anthem’s breach could potentially affect as many as 80 million customers! Unfortunately, we were some of those potential 80 million. But, I’m not stressing out about it because we also utilize these 5 ways to protect your personal data. 1. Be careful where you leave your personal info. These days our personal information is floating around everywhere. Most addresses and phone numbers can be pretty easily found online, but websites should have a way for you to opt out of their service. Also be careful of where you post online. A seemingly innocent picture of your kids by your car that shows your license plate number or in front of their school or photos with location tagging turned on and posted publicly can be a way for predators to find addresses or track your children. More and more companies are also doing online research about you during the interview process. Be sure to regularly check your privacy settings on social media and other services to be sure your info is safe. 2. Shred paperwork you no longer need. While many items are tied to digital data these days, there’s still a lot of personal data on paper. Be sure to shred any paperwork with personal data that you no longer need instead of just throwing it away like medical and tax records. 3. Keep your gadgets and software up to date and secure. As with the Anthem breach, more and more data leaks and hacks are occurring online. While there’s not much you can do about your data once it’s on someone else’s hardware and servers, it’s very important to keep your own gadgets and software up to date and secure. Your phone, email, and computer can all be hacked. That’s why it’s important to have a good antivirus and internet security software program installed on your computer and mobile devices. While it can be tempting to wait out software updates to make sure any bugs don’t need to be fixed for a few weeks, it can also put you at greater risk as updates often patch security risks. 4. Never submit your info online without a secure connection and change your passwords often. Many of us love shopping and being able to pay bills online, but it’s very important to make sure you’re doing so over a secure connection to protect your data. Always be careful of where and how you’re submitting your information. Companies usually don’t email asking you for your password. I always log into the site by entering the address in my browser to see any important messages than risk phishing, an email that looks official but is actually fake and designed to collect your login information. Also update your passwords regularly and, while convenient, don’t save your payment info in your accounts. 5. Use a service like LifeLock. LifeLock provides identity theft protection through several layers. LifeLock monitors and scans for threats against your identity, and can also track your credit score for any questionable inquiries. I really love that LifeLock will alert you as soon as they detect any potential threats to your identity. They also provide up to 1 million in coverage if your identity is stolen for things like lawyers, fraudulent withdrawals and other costs. Life is so busy these days, it can be difficult to keep up with all the things you know you should to protect your identity and information. I find it’s so worth it to invest as little as $10 a month for the peace of mind and reassurance, not to mention one less thing to worry about. Do you use any of these 5 ways to protect your personal data? Have you ever had to go through your identity being stolen? This is really great information! I think everyone should be proactive and take steps to secure their personal information. My personal information was actually stolen three times in one month. It was my worse nightmare come to life, but ever since then I have taken all the extra steps possible to protect myself. These are some great tips. I have been hacked more times than I like to admit. Thanks for the info! These are very sound advise! Identity theft is a scary thing, we have to make sure that our information are protected. Lifelock does that for us. These are all great tips. It’s really scary when you see all these large corporations get hacked and put your personal data at risk. It hasn’t happened to me but it has happened to my brother and my mom. Thanks for these tips. You can never be too careful these days. I used to just throw out all my mail with personal info or not. Now I shred it all. Great tips! I always shred paperwork I don’t have any use for anymore, it really helps getting things more tidy as well! These are some great pointers. Personal security of my data is something that’s very important to me. I’ll pass this info on to others as well. thanks! That is so scary how easily your information can be stolen and you provided some great tips to project yourself. I wasn’t aware of lifelock until now! Thank you! These are all great and important tips. I never thought about the first one with photos and my license plate. Thanks for sharing these! Security andp privacy of personal data is very important. It’s good to invest in a sturdy paper shredder to destroy sensitive files you no longer need. Keeping my data safe is definitely a high priority for me. I try to change my passwords every now and then. I should probably do so more often. It’s almost scary at how careful we have to be to protect our personal data. These are all really good tips to ensure our safely. We have homeless people rummaging through our garbage (communal dumpster) EVERY night. So sketch. I always shred important doc’s by hand (and even our address on the front of envelopes). You never do know!! Thank you for sharing wonderful tips from you, this would be helpful in the future I’m so thankful. Great tips! All so very important and I hope more peop lelearn to do this and can keep their info protected. It’s such a shame all the people who have their info stolen! I do all of these, and because of that, I’ve never had my identity stolen. I am absolutely paranoid about it. This is all great advice. I think it’s important that we are all careful with our personal info.